Half of all new businesses fail in their first five years, according to Forbes.com. Passing that five-year milestone was an event a long time ago for Elgin Sweeper, which threw a party on June 21st to commemorate a century of manufacturing street sweepers in Elgin. "One hundred is a monumental accomplishment," said Mike Higgins, Elgin Sweeper's vice president and general manager. "We wanted to celebrate with the employees and their families. It's good for them to see what we do here. "Considering that very few American businesses can claim such a unique distinction, we are immensely proud of our 100-year milestone, as well as our legacy of innovation and industry leadership. "Through two World Wars, the Great Depression and significant economic challenges in recent years, the ingenuity and steadfast commitment of Elgin Sweeper's employees and dealer partners to serve our customers has been critical to our success." 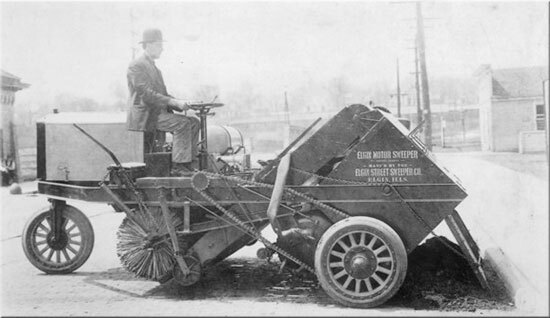 Driven by a desire to address the health hazards caused by streets and roads filled with filth and debris, pioneering automobile enthusiast John Murphy, who was a resident and alderman of the Elgin, IL, brought his design for the first mechanized sweeper to American Tower and Tank Company of Elgin. After two years of trials with the original design, the company was ready to go to market. 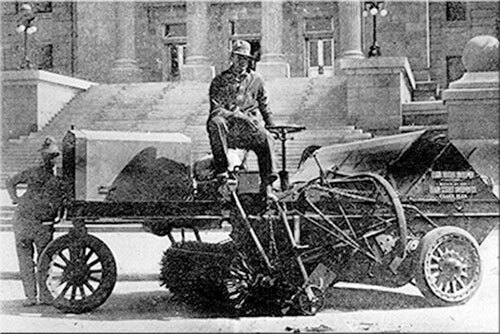 The first motor sweeper, a three-wheeled machine, was sold in April 1914 to the City of Boise, ID. The company sold 15 sweepers in 1915 and 42 sweepers in 1917, the same year the growing organization became Elgin Street Sweeper Co., with a facility on the Fox River, near the current location of the Grand Victoria Casino along South Grove Avenue. In the mid-1960s, the manufacturer and well-known brand of street sweepers moved to its current location, 1300 W. Bartlett Road, on Elgin's southeast side. By 1922, the market for the Elgin sweeper was so promising that the owners of the Elgin Corporation terminated their relationship with American Tower and Tank Company and the company became the Elgin Street Sweeper Company. Years later, the company incorporated as Elgin Sweeper Company. In 1982, Elgin Sweeper was acquired by Federal Signal Corp., a leading global designer and manufacturer of products and total solutions that serve municipal, governmental, industrial and commercial customers. Today, Elgin Sweeper is a key brand of Federal Signal's Environmental Solutions Group. "Elgin Sweeper has certainly improved upon Mr. Murphy's original sweeper design over the years, but his original concept of a street cleaning machine lives on," Higgins said. "Some of the improvements made to the sweeper include the introduction of a gutter broom, expansion of the hopper capacity, use of a diesel engine and development of an integrally welded body to deliver unmatched strength and durability." Elgin Sweeper still operates in Elgin, employing approximately 200 people in factory-related jobs and another 150 employees in management, engineering and administrative positions. World War I hadn't yet begun when Elgin alderman and automobile enthusiast John Murphy brought his design for a mechanized sweeper to American Tower and Tank Co. of Elgin, according to a release. After a couple years of testing, the first unit was sold to the city of Boise, Idaho, in April 1914. The well-attended 100th anniversary celebration was a chance for former employees to revisit while current workers could show off the organization to family and friends. "We all rode our motorcycles in from Machesney Park," said 27-year-employee Ron Verhagen of Rockford as he showed around members of the Rock River Harley Owners Group. "It's a nice day for a ride," he said. The group gathered around an antique Elgin Sweeper, manufactured in 1931, owned by a history museum in St. Louis that has loaned the unit to the Elgin company in the past. "I've offered to buy it from them," said Higgins, "but they won't sell." The antique sweeper was a highlight of factory tours that had groups criss-crossing through the plant – past the robotic welders, paint bays and sweepers in various stages of completion. Outside, kids climbed on trucks while families and friends waited in line to take a spin around the parking lot on a sweeper. But the day was for the employees who touted the organization as they greeted visitors, helped riders in and out of the sweepers or relayed the company's history. Jim Rothgeb, a 34-year-employee from Gilberts, sported an Egyptian pharaoh hat as he entertained the crowd. "It's a great company to work for," he said. As one of the most enduring brands in North America, Elgin Sweeper joins an elite list of companies that have reached the century mark. Established in 1914, Elgin Sweeper is at the forefront of the sweeping industry, advancing the use of cleaner, safer, and healthier energy technologies. Offering the latest sweeping technologies – mechanical, pure vacuum, regenerative air, alternative fuel and waterless dust control – to municipalities, contractors and industries, the company is committed to providing exceptional sweeper performance while reducing the overall negative impact of air and water pollution on the environment. For more information on Elgin Sweeper, visit www.elginsweeper.com and follow Elgin Sweeper at http://www.Facebook.com/ElginSweeper. Sold and serviced through a network of more than 100 dealer locations worldwide, Elgin Sweeper products are the sweepers of choice for a variety of general street maintenance, special industrial and airport applications. With 100 years of experience, Elgin Sweeper offers municipalities, contractors and industries the most sweeper options in the country, using the latest sweeping technologiesÑmechanical, pure vacuum, regenerative air, alternative fuel and waterless dust control. Elgin Sweeper is a subsidiary of Federal Signal Corporation's Environmental Solutions Group. For more information, visit www.elginsweeper.com. For more information on Elgin's 100 years in business, check out the article on the company's website.